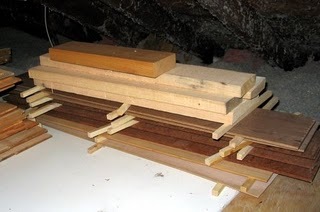 Here is some of the wood that has been up in the attic. This was resawn about a year ago. I take what I am going to use and keep it in the shop for a few weeks so that it can get acclimated to the environment in which the instrument will be built. I keep the humidity in the shop at around 40%. Here’s a two piece Walnut back that is about to be joined. 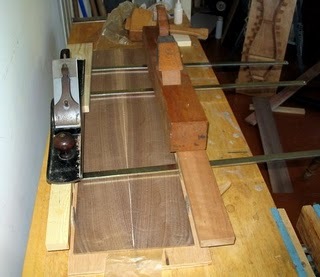 The wood is sawn in two consecutive slices off the same board so that the grain is book matched. When joined the two halves will be a mirror image of each other. To start I clamp the two boards together against the bench. There is a spacer under the two halves of the back elevating them a bit so they are within reach of the planes blade. I then shoot the joint with a long jointer plane (for you old tool aficionados I’m using a Stanley #7 type 11 with a Hock A2 blade honed with a 10 degree back bevel.) For those of you who are not old tool aficionados (in other words, normal people) I’m using a long plane with a good blade sharpened and set up to take a very fine and smooth cut. After the joint is shot true I edge glue the two pieces together using a few cam clamps. 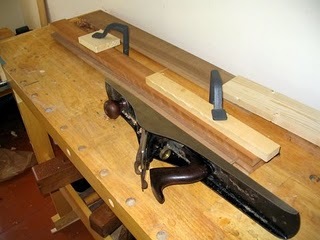 I weigh down the ends of the clamps to keep everything stable. I usually use a few planes as weights because they live right under the bench. I tamp down the joint with a mallet to make sure everything is lined up evenly and then I go do something else while the glue dries. Does anyone else find this interesting? Let me know!